Searching for secure external hard drive to protect your private and confidential data? The Aegis Bio is a hardware encrypted biometric external hard drive from Apricorn which can allow users to protect their secret files and datas with state-of-the-art, 128-bit AES encryption and fingerprint recognition. In other words, the secured data can only be accessed with a swipe of a finger (up to 1o fingerprint) that already get registered. With 16-point omni-directional shock mounting system, the Aegis Bio can protects itself from accidental drops and bumps. 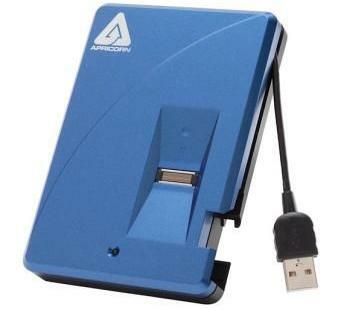 In addition, this fantastic USB 2.0 portable hard drive requires no software installation on the host PC. Perfect for people who demand the highest level of protection for their data! The Aegis Bio that features a 5,400rpm spindle speed and an 8MB cache is available in 80GB, 120GB, and 160GB capacities for $199, $219, and $289, respectively.